This is the fifth in a series of posts I am making, which will be extended to create a book, Around the World in 90 Minutes. They don’t make it easy to get into Bangladesh. Visa on arrival should be straight forward, but here it is anything but. First you have to fill in two forms – no specific reason for this as far as I could see as the same general information was on both. Then you have to queue to pay. The sign says that it is US$20 for a transit visa, and US$50 for a normal visa. Many of those queuing (including myself) ask about the transit visa, but they are told they cannot get it here. So, it is US$50 to enter, plus another dollar as tax. The point of this is unclear, as surely the whole sum is a tax. I then queue again to pick up my visa, where I meet with an official who is determined to make things difficult, both my onward reservation and hotel booking are on my phone, rather than paper – and worse still, I do not have an invitation to enter the country. After taking time to tell me I needed this, and then going back on his original acceptance of my electronic reservations, I had the visa added to my passport and was allowed to enter. I then just had to get past the various touts and find the car that was taking me to the hotel. This is not easy as there are three places where people wait with name cards for transport. Once in the car, we waited about 20 minutes to turn right at the first junction, and I did not get to the hotel for two and a half hours after landing. 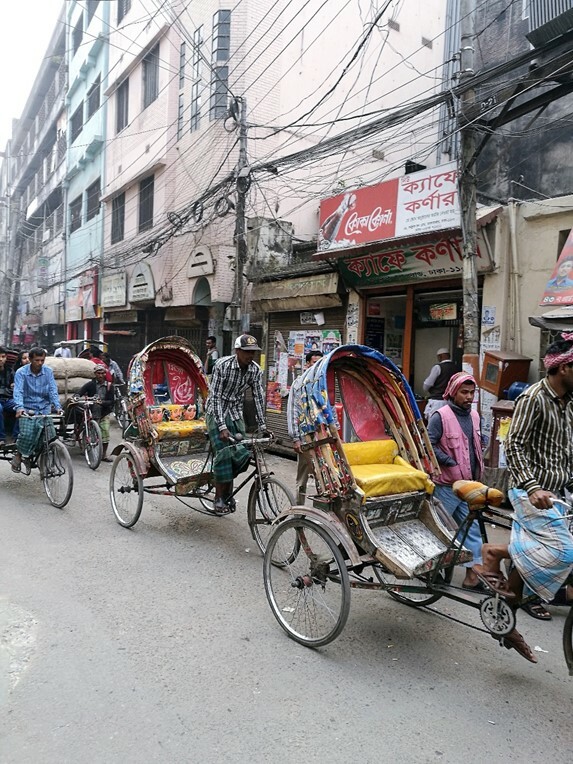 Dhaka is cycle rickshaw central, with more of the beasts here clogging the roads than anywhere else. I tried a ride which took around 20 minutes. Cheap, but I recommend them for shorter trips only. It can be scary as they negotiate traffic, and the suspension leaves a lot to be desired. I am watching each the current top three teams, and Farashgonj, bottom of the table. Farashgonj need a win to have a chance of escaping relegation, while Sheikh Jamal have nothing to play for as the results over the last couple of weeks means they must finish in second place. With the game apparently won, the second half was somewhat lacking. Sheikh Jamal now had more of the ball, but we go halfway through the period without a single effort worthy of the name. When two chances presented themselves, both were hit wide of the target. The second game got going about ten minutes late, and it is fair to say that nothing at all happened in the first half. One might have thought the Chittagong version of Abahani woud try to get one over on their Dhaka namesakes, but there was little evidence that either side was concerned about the result. With the League finishing this week, the national independence cup starts a few days later. For the league, the teams were allowed to have three foreigners signed on and to play two of them at anyone time. When it comes to the cup, they will have to make do with local players only. Supposedly, this will help the local players to get more of a chance. What the contracted but idle foreigners do at this juncture is anyone’s guess. The Asian Football Confederation runs two tiers of international club competition. The Champions League and the AFC Cup. There are basically four levels of country participation. The third level only have teams in the AFC Cup. Bangladesh and the Maldives both have one directly qualified for the group and one in qualification knock out. India has the same, but their main entry also plays for the Champions League. Bhutan had a team in AFC Qualifying only. Finally, there are the country with no entries. The AFC does not specify any countries as not suited to competition, but would have to re-arrange something without this group. Most of these countries have failed to comply with AFC Licencing rules, (hence no Sri Lanka), a couple are under FIFA suspension (no Pakistan), while although listed as not complying with licensing rules, one country has no league to qualify from at the moment (so, no Nepal). Bangladesh, as mentioned have one place in the group stage of the AFC Cup. 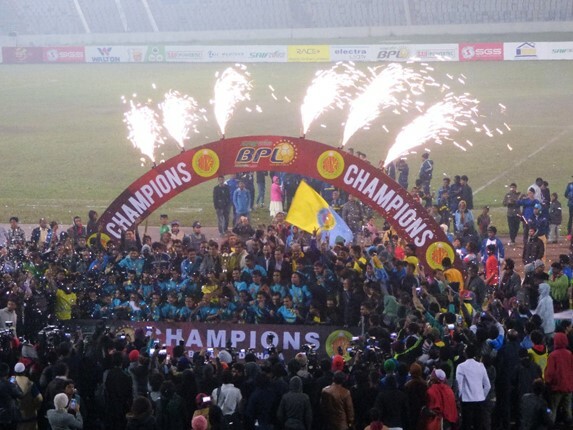 There is just one “South Asian” group, and Abahani as champions will take their place with Aizawl (or designated replacement, Mohun Bagan), the Maldivian champions and a play off winner who can come from Bangladesh, Maldives, India or Bhutan. 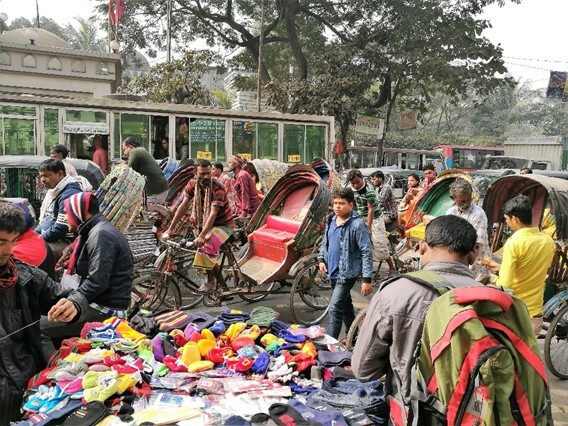 As the key city to Bangladesh, Dhaka struggles to present an attractive prospect. The people you meet tend to be friendly, and polite, and you frequently get asked where you are from. I did not get hassled by beggars, although one of the cycle rickshaws followed me for half a mile before taking the hint that I meant what I said, that I would be walking for at least an hour. The abiding sound of the city is the cacophony of car hooters and cycle bells (from the rickshaws). 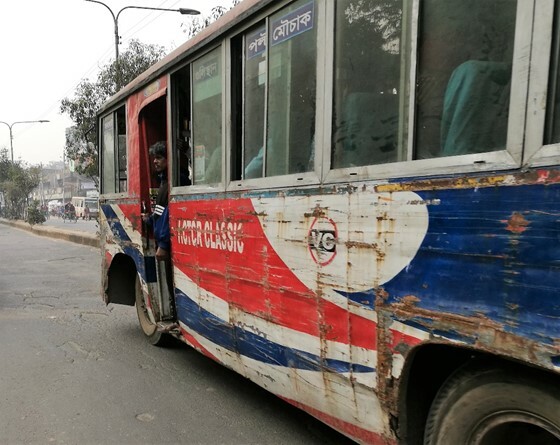 You cannot help but notice the state of the local buses, many hundreds of which can pass you. Almost without exception, they are dented and scratched on every single panel. I did ask, but could not get an explanation of how they got into this state. 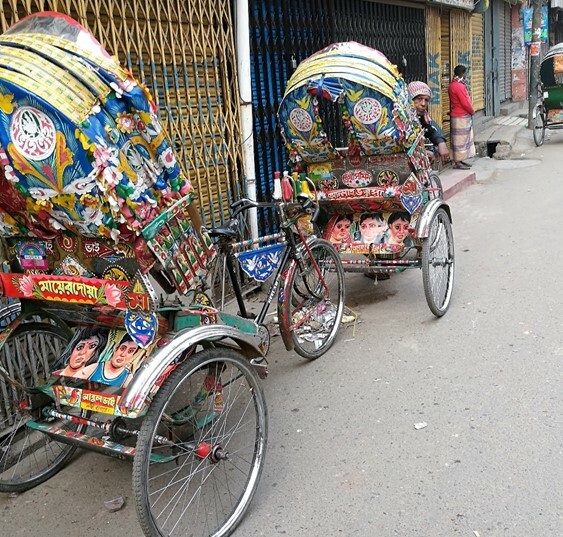 They appeared as if they may have been running in a demolition derby between shifts carrying the population of Dhaka around. The sights are few and far between, unless you count the massive jumble of human activity. It did appear the streets, and particularly the pavements got busier after dark. As I had been struggling health wise through the trip, I did not go out. Even had I been feeling healthier, there are no bars to go to, plenty of chances to eat though. Exiting the country turned out to be easier than entering, although slower than I had hoped as the flight was rescheduled as one hour late and was actually much later. 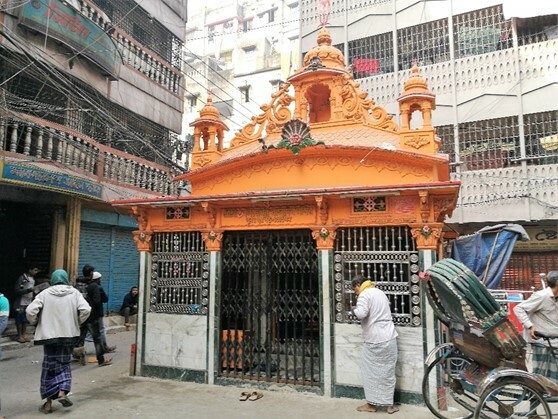 On the Saturday after I left, Rahmatgonj, who had dropped to bottom following Farashgonj’s win, surprised Saif – who could have risen from fourth to third. Rahmatgonj’s win returned Farashgonj to the relegation position. Three of the six matches in the last round of fixtures (one each day) finished scoreless. Over 13% of the matches in the league for the season finished scoreless, making it one of the best places in the world for the game without goals. My appearance at the game caused a lot of interest in the press box, and gave me a chance to discuss the prospects of Bangladesh football. 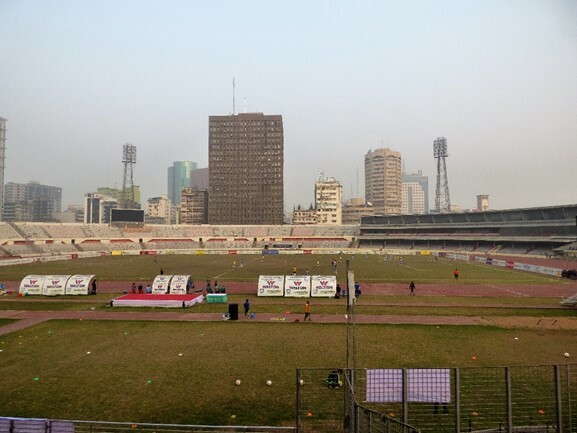 Curiously, they tell me there are several other stadiums that could be used for League football, both in the Dhaka area and further afield. 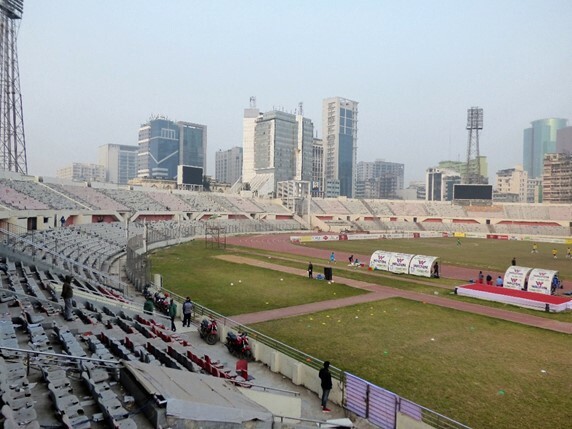 The major ground in Chittagong has been known to stage games in the past. 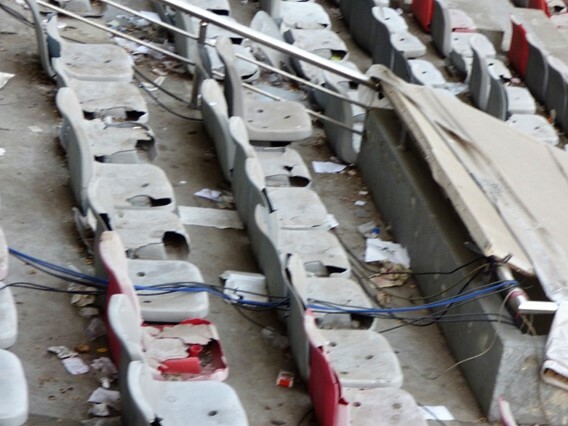 While all are agreed that more interest could be created in the games by staging some teams games elsewhere, it appears there is no interest within the Bangladesh Football Federation in changing anything. This entry was posted on Wednesday, January 24th, 2018 at 01:36 pm and is filed under Asian Football, ATW90. You can follow any responses to this entry through the RSS 2.0 feed. Both comments and pings are currently closed.